For most of us, winter signifies the time to put away the rod and reel for another season. However, if you live in a part of the world where the temperatures really drop, covering lakes and rivers with sheets of thick ice, then there’s still plenty of opportunity for a spot of fishing. Ice fishing, of course, requires ice, and normally a lot of it. You’ll also need some specialist gear, a bit of know-how and the capacity to shrug off the cold with reckless abandon. If you tick all of these boxes then you can have a ton of fun fishing on the ice. If you have everything apart from gear, then we can maybe help out. Ice fishing requires a specialized rod and reel, your normal spinning rod and reel might just work, but it’s far from ideal. We understand that it can be difficult to get recommendations from trustworthy sources that aren’t just out to make a quick buck from affiliate commissions. That’s why we created this website, as we wanted to improve the industry. In this article we’re going to take a look at some best inline ice fishing reels, diving into to the criteria we used to rate them and what makes a specific model better than another. If you just want to know our recommendations for the top-rated inline ice fishing reels without all the additional fluff, then the table below will help you to make a quick decision. If you have any experience ice fishing you’ll know a few things already, it’s cold and you fish through a hole in the ice. Because it’s cold, we like to keep ourselves out the worse of the weather using huts, tents or any other type of shelter. This means there’s limited room for setting hooks. Additionally, as we’re fishing through a hole, we have no need to cast our bait. Due to the reasons mentioned above, we want to keep our rod short and manageable in cramp conditions. If we also need to factor in the lethargic responses of nearly frozen fish, we’ll want to keep our gear light. The lighter the rod and reel are, the more likely we are to feel even the slightest of nibbles from fish in a cold-induced stupor. That’s why you’ll find the majority of ice fishing rods to be very short. In addition to short rods, we’d expect our reels to be a very lightweight design and then coupled with light lines. This light gear approach to ice fishing will maximize our chances of fishing success. Inline Ice Fishing Reels (also known as Straight-Line) have one outstanding feature that makes them a must-have piece of kit. They’re exceptionally good for jigging. 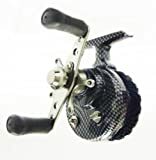 AS the design of inline fishing reels forces the line out of the spool in a straight line, it prevents many of the issues experienced using very light lines, such as twisting and corkscrewing. These types of issues make jigging challenging as lures tend to act unnaturally in the water due, which is off-putting to fish. An inline ice fishing reel allows you to completely avoid this unnatural behavior of the lures. Another upside of inline ice fishing reels is that the design is rather simplistic. As with many simple mechanisms, they are less prone to issues, especially when the temperature really begins to drop. I’ve also found them to be easier to use over extended periods of time. Your hands will naturally fall into a pistol like grip which is comfortable and is less like to produce repetitive strain when jigging for any length of time. They are of course not without their downsides. I find one of their biggest strengths is also one of their biggest issues, which is their simplistic nature. If you’re looking for advanced drag characteristics or something you can use in other situations, then an inline reel is probably not for you. A good ice fishing reel needs to have a decent drag system. As we’re using light lines and gear, it’s very important that we can adjust out drag, especially when we’re looking to catch more powerful prey such as walleye and pike. We need our to have a bit of give, but not enough so that we’re likely to lose our hookset during a fight. You want the drag to offer enough resistance so that we can overcome the fishes fight and muscle it into a catch, but not so much that we risk breaking the line or tearing the fish. Unfortunately this an area where inline ice fishing reels fall flat compared to other reel types. Inline ice fishing reelings do offer variable drag, but it’s not as advanced or refined as spinning reels or other reel types. Inline reels will generally use a Star Drag system. They work by increasing or decreasing the friction placed on the spool. For inline reels, its a pretty basic setup, which will rarely offer very fine adjustments, but it will generally do the job for most people. 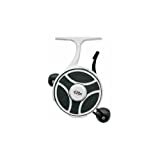 If you’ve already conducted some research into inline ice fishing reels, then you’ve probably come across the 13 Fishing Black Betty 6061. It’s frequently referred to as the best ice fishing reel available, not just best inline ice fishing reel. We especially like the solid machined aluminum body, it gives the impression that its a solid piece of kit. If you’re planning on jigging, which you probably are given that you’re ice fishing, then this reel is sure to meet your needs. It’ll accommodate 1-pound mono line and up, so we can keep our gear nice and light. To help your jigs descend quickly, the reel features a free spool button. Its action is very smooth and will allow even the lightest of weights to pull the line down in no time at all. As with all inline reels, the large spool completely avoids any issues associated with line memory or twist. For an inline reel, the drag works well enough to be usable. It’s not as good as a high-end spinning reel, but as far as inline reels go, it’s more than up to the job. If you’re looking for the best reel for ice jigging, then this should be right at the top of your wish list, you can’t get anything better. Our biggest gripe with the reel is that its a bit on the expensive side compared to other reels that look similar on paper. You’ve no doubt come across the eagle claw brand before, they make some of the best hooks available. But, does their proficiency with hooks translate into quality ice fishing reels? The answer is yes. Eagle Claw produce a very budget friendly inline ice fishing reel made from very robust nylon. As with the Black Betty, the larger spool on the Eagle Claw completely prevents line memory, twisting and tangling, so they are of course an excellent choice for ice fishing. Given the reels significant spool capacity, you’ll be able to use more line that you’re ever likely to need. You’ll find the gear ration will make quick work of any deep water jigging you choose to do, bringing the line up will be quick and efficient. To ensure you can get your jig into position as quickly and seamlessly as possible, the reel features a spool release button. The action is smooth and it only takes a small amount of weight to quickly allow the jig to drop. However, the reel is definitely a budget model, which you can feel when it comes to setting the drag. Unfortunately, it’s finicky to use and borders on ineffective when you’re looking to fine tune the settings with a very light line. It’s possible this was just the model we saw, but be wary that using line under 4 pounds may be challenging. Frabill has been around for a number of years now and the straight line 371 is one of their more popular products. The reel itself has been made from composite materials, which makes it immune from corrosion caused by saltwater conditions. It also means that it will continue to work seamlessly, even the temperatures really begin to dip. The gear ratio means you’ll be able to muscle fish with no problems, but retrieving a jig may be slightly slower than with other inline reels mentioned above. When we need to let the line drop quickly, the free spool button very effectively drops the jig smoothly and with very little weight required to do so. We found it easy and comfortable to use, even with gloves on. If you’re looking to be the jigging master of ice fishing, then there’s no doubt in my mind that you need to get an inline fishing reel. All of the reels listed above will deliver great performance. The Black Betty 6061 ticks every box that we can think off, no tangles, easy to use, great gear ratio and a well built finely tuned drag system. It’s simple design and machines aluminum fishing means it’ll last through all weather conditions and should see you through a lifetime of use. It’s simply put, better than its competitors and will perform better in almost any situation. The drawback is that it costs a lot. If you want something cheaper than the eagle claw or frabill are great choices.